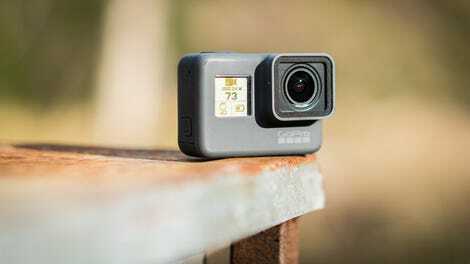 GoPro has been the leader on action cameras from the very beginning, and its brand has attained a kind of Xerox-like omnipotence—despite the company’s ongoing struggles in recent years. Amongst GoPro’s problems is the difficulty in making the improvements to its line look like anything more than iterations. 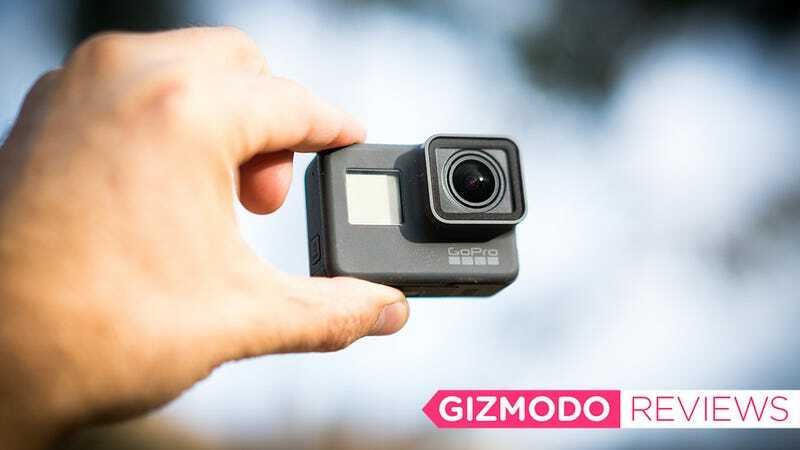 With its new Hero6, GoPro has juiced its top camera’s guts to make it capable of some frankly incredible slow-mo action. Whether that’s enough to make a difference, remains to be seen. On the outside, the GoPro Hero6 is identical to the Hero5 except for where the model number is faintly written on the side. That’s not a bad thing as the Hero5 was generally excellent. It’s still waterproof to 33 feet without the need for a separate housing, it still has a very bright LCD touchscreen on the back, and it still works with a gajillion mounts and accessories, including GoPro’s own Karma Drone and Karma Grip gimbal. The Hero5 and the Hero6. I have no idea which is which. 1080p footage comparison and review video with slow-motion goodness. Philosopher Dave Chappelle once said, “Everything looks better in slow motion,” and he was basically right. Being able to shoot 1080p at 120fps for five times the slow motion was really sweet, but 240fps for ten times the slo-mo is entering a whole other realm. Moments that pass by in an instant are suddenly clearly preserved in a way that your eye can appreciate. Water takes on a whole new life. When watching a bird fly away you can see each individual feather flex and rotate as it flaps. It’s just. So. Freaking. Cool. I found myself wanting to film all kinds of things that I normally wouldn’t care about (hello, blowing bubbles underwater) just to see what it looks like in slow motion. A more expensive action camera with gorgeous slow motion. A couple of irritating bugs and so so mic quality. GoPro also touted its new electronic image stabilization as its best yet. The good news is that at 1080p it works extremely well. The images are smooth, and while you lose a bit of the field of view (it crops 10 percent off the sides) it doesn’t appear to reduce image quality. Unfortunately, that’s not the case for stabilized 4K video. With 4K, that 10 percent costs you, with images becoming noticeably more pixilated and glitchy. It probably wouldn’t seem so bad except that Sony’s X3000R Action Camera exists. That Sony is the only action cam that has optical image stabilization, and hoo boy is it smooth! Not only that, it doesn’t have to crop the edges so there’s zero quality loss or field of view loss at 4K. Overall, the Sony isn’t nearly as easy to use as the Hero6, and I experienced a lot of bugs with it, as well as some significant image quality issues, which I address in the test-footage videos (1080p video above, 4K video below). On the 4K side, the Hero6 looks great. When it first launched there were some issues with colors being massively oversaturated, and that was somewhat blinding in 4K, but GoPro just pushed out a firmware update and now the colors look far more accurate but still have plenty of vibrance. The only other action camera that can shoot 4K60 is the Yi 4K+, which, at $300, is a full two Benjamins cheaper than the Hero6, but man, you get what you pay for. Not only did the Yi consistently have the worst image quality of the crew but it was also a serious headache to use, with constant card errors (despite using three different cards) and other bugs. Of the four cameras I was comparing I found the Hero6 consistently had the best color-balance with the exception of some low-light situations where the auto white-balance turned everything green for some reason. Noise in low-light is a problem as well, but it also offered the brightest image with the most detail. It’s a giveth/taketh away kind of conundrum. The rig I built for comparing footage. From left to right: GoPro Hero5, Sony X3000R, GoPro Hero6, Yi 4k+. Another new addition to the Hero6 is 5GHz wi-fi which allows you to transfer footage to your phone three-times faster than the Hero5 could. That’s a welcome addition. GoPro’s Quik app has a “Quik Stories” feature that is supposed to leverage sensor data and some new machine learning built into the GP1 chip, smash it together, and automatically create edits for you. This would be awesome if it worked! Which it doesn’t. Not only did Quik consistently fail to recognize the best moments from my clips, but it would occasionally build my stories in reverse order, it doesn’t turn high frame-rate shots into slo-mo, and sometimes it wouldn’t let me access my clips at all. It’s a great idea that still needs a ton of work. Something to note is that when you switch to one of the more processor-intensive modes (4k60, 2.7k120, or 1080p240, for instance) the Hero6 records in the relatively new h.265 (HEVC) video codec. This new standard allows 4K files to be 40-percent smaller, supposedly without losing any quality. This seems to check out. While the Sony shoots at a higher bitrate (up to 100MB/sec) in most scenarios I found that detail is generally better on the Hero6, despite the smaller file sizes. The downside is that not all computers or phones can view h.265 yet. Apple only just added support for HEVC in OS 10.13 High Sierra and iOS 11 (though Adobe Premiere can handle it in earlier OS X versions). It’s just a bit more of a pain to deal with. Who left the doors open? Audio quality is a bit of a conundrum. Because the Hero6 doesn’t need a case the microphones have membranes in them that keep the water out but also muffle the sound a bit. That means that when compared to the Sony or the Yi when they’re out of their cases, the Hero6 sounds really bad. That said, when the Sony and Yi are in their waterproof cases you basically can’t hear anything at all, and the Hero6 is the clear winner. In general, I’d say the Hero6 sounds great for action sports, but you probably aren’t going to want to record interviews with it. The Hero6 is also a still camera, of course. It can shoot both RAW images and now HDR images, too. I found that the HDR shots tend to be a bit over-the-top. They look almost surreal and often come in oversaturated. In general, you’re better off shooting in RAW and then tweaking the levels in Lightroom. Those gripes aside, I’m extremely impressed with this camera. It has the best dynamic range of any action camera I’ve used, preserving details in the shadows even when a subject is backlit. Images are very sharp, and colors are lively without looking like an acid-trip through Candyland. And again, I just want to shoot everything in slow-motion because it looks so amazing. The final stumbling block is the price. The Hero6 comes in at a cool $500, which is a drag considering the Hero5 launched at $400 and that’s how much it still costs. For most people the Hero5 is going to be all the camera you need. I’ve been using it a ton for the last year and it’s held up extremely well and its footage looks alllllmost as good as the Hero6. So, you have to ask yourself if that super sweet slow motion is worth it to you. Personally, if I didn’t already have an action cam then yes, the additional 100 bucks is worth it to me. If I already had the Hero5, though, I kinda doubt I’d shell out for the upgrade. I’d want to, but I don’t think I could justify it. The bright LCD touchscreen is very responsive and is easy to see even in bright sunlight. The Sony X3000R comes in at $400 and while it takes great footage in bright light, I’d probably only recommend it to people for whom stabilization is their absolute number-one most important factor. I really missed having a touchscreen when using it, as its menu system is infuriating, and it’s tougher to frame shots properly (you have to use the app or the remote-control with screen, which is sold separately). Also, it struggles with dynamic range which is pretty important for action content. The Yi 4K+ is only $300, but I can’t recommend it to anybody due to its sub-par image quality and considerable bugginess. For the majority of people I’d say get Hero6. Unless you already have the Hero 5. Then it’s likely best to wait. Absolutely bonkers slow motion in full 1080p. Gah, it looks amazing. Best in class dynamic range, excellent color balance with recent firmware update. The electronic stabilization is good, but not as good as Sony’s optical stabilization. Really wish they decided to sell it for $400. $500 is pretty steep for something you’re going to throw off a cliff.